The Four Seasons Resort at Punta Mita offers 173 stunning guest rooms, including 30 suites, and three private residences set along the Pacific Coast in Mexican-style casitas. Most guest rooms and suites enjoy spectacular views of the pristine white sand beaches, the Pacific Ocean and beautiful mountains surrounding this exclusive resort. For more information on the accommodation please see the side menu. 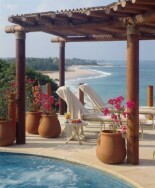 The northern most resort in Nuevo Vallarta, on Punta Mita. This is the northern coastal point of Bahia de Banderas. 50 minutes north of Puerto Vallarta. The Puerto Vallarta International Airport is 40 kilometres (25 miles) from the Resort. It is served by Aeromexico, Air Canada, Alaska Airlines, American Airlines, America West, Aviacsa, Continental Airlines, Frontier Airlines, Lineas Aereas Azteca, Mexicana Airlines, Sun Country and United Airlines. Rental cars (4x4s are the most popular) are available. There is valet and self-parking at the Resort. The Four Seasons at Punta Mita is an exclusive and secluded five star luxury resort located just 26 miles from Puerto Vallarta in Mexico. Situated on the Pacific Coast it offers guests stunning views of the ocean, pristine white sandy beaches and is edged by one of the world’s best and most unique, Jack Nicklaus designed, 19 hole golf courses. Also featuring a spa, a large free form infinity pool, tennis and a variety of water-sports, the Four Season Punta Mita is one of the most exclusive resorts in the Puerto Vallarta area. As well as the 140 stunning rooms and 30 suites located throughout the resort there is also a chance to experience some of the most exclusive and sort after private villa accommodation in Mexico. The resort has access to three very exclusive private four and five bedroom residences which are available for hire with access to all of the resorts facilities. They are best suited to the traveler looking for privacy and seclusion without sacrificing the facilities that are normally offered with a five star resort experience. Punta Mita is an innovative, master-planned resort and residential community covering more than 1,500 acres on a spear-shaped peninsula. The resort is a gated, low-density development planned in accordance with the highest quality of international real estate and environmental standards. The eco friendly golf course was developed with careful environmental planning; includes such features as a state of the art computerized weather station to monitor ground moisture, helping to conserve water by irrigating greens and fairways only when needed. Environmentally safe organic fertilizers are used in place of chemicals, employing little or no herbicides or insecticides, with only biodegradable insecticides used on greens bordering the ocean. Natural vegetation, including 26 acres of native grasses, has been preserved in and around the course. As well as it’s many other activities The Four Seasons Resort Punta Mita owns and operates a 55-foot, luxury yacht that can accommodate 10 passengers for day excursions and sunset cruises. The private launch features an air-conditioned interior with three staterooms, three bathrooms, living room and kitchen and ample deck space for sunbathing. The Four Season does not disappoint with its extensive range of activities and amenities. The resort features a large free-form pool with oversized spa pool, poolside lounge, towel service, restaurants, bars, snack bar, 4 lighted tennis courts, shops and a comprehensive activities program. 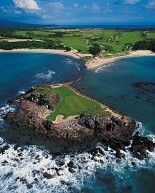 The Four Seasons Resort, Punta Mita also has a full fitness center as well as a rejuvenating Spa facility. However its biggest draw card is the unparalleled private Jack Nicklaus designed championship golf course, which is distinguished by its breathtaking ocean views and 200 pristine acres of lush, rolling hills and flowering landscapes. The 7,104-yard, par-72 course features eight ocean-side holes and an optional "19th" par-3 hole with a natural island green, making it the first of its kind in Mexico. Another unique activity available from the Four Season at Punta Mita is its own exclusive launch available to its guests for private charter in the Bay of Banderas. The 55ft yacht features a living room and kitchen with dining table, a separate, shaded relaxation area on the upper deck and sunning areas on the bow, stern and rear upper deck. The ship also sports a Wave Runner for guests to ride when the yacht is anchored. Accommodating up to 10 guests for six hours during the day or for sunset, each charter includes an elaborately catered assortment of snacks and drinks to keep guest satisfied during their cruise.